How can I report a map error? Important: For safety reasons, do not enter the full details of a map correction while you are driving. Mark the location of the map error instead and enter the full details later. Tap Map corrections in the Settings menu. Tap Correct a map error. Select the type of map correction you want to report. Select how you want to select the location. Select the location. Then tap Done. Enter the details of the correction. Then tap Done. 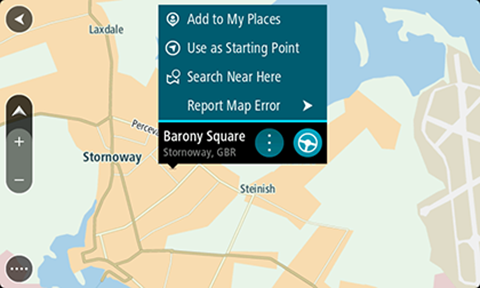 To make a correction to your map, tap Map corrections in the Settings menu, then tap Correct a map error. There are several types of map correction available. Tap this button to block or unblock a street. You can block or unblock the street in one or both directions. Tap Near you to select a street near your current location. You can select a street by name, a street near your Home location or a street on the map. Select the street or section of a street you want to correct by tapping it on the map. The street you select is highlighted and the cursor shows the name of the street. Your device shows the street and whether the traffic is blocked or al-lowed in each direction. Tap one of the direction buttons to block or unblock the flow of traffic in that direction. Tap this button to correct the traffic direction of a one-way street, where the direction of traffic is different from the direction shown on your map. Note: Reverse traffic direction only works for one-way streets. If you select a two-way street you will be given the chance to block/unblock the street rather than changing the direction. Tap this button to change the name of a street on your map. Type the correct street name. Tap this button to change and report incorrect road turn restrictions. Tap this button to change and report the road speed limit. Tap this button to add or remove a roundabout. Tap this button to add a new Point of Interest (POI). Tap Restaurant in the list of POI categories. Select the location of the missing restaurant. You can select the location by entering the address or by selecting the location on the map. Select Near you or Near home to open the map at your current location or at your Home location. Type the name of the restaurant then tap OK. If you know the telephone number of the restaurant you can type it, then tap OK. If you don't know the number, just tap OK without typing a number. Tap this button to edit an existing POI. Change the telephone number of the POI. Change the category that a POI belongs to. Move the POI on the map. Tap this button to enter a comment about a POI. Use this button if you cannot edit the error with the POI using the Edit POI button. Tap this button to correct the location of a house number. Enter the ad-dress that you wish to correct and then indicate on the map the correct location of that house number. Tap this button to edit an existing street. Once you have selected the street, you can select an error to report. You can select more than one type of error for a street. Tap this button to report a missing street. You have to select the start and end points of the missing street. Tap this button to report an error about a motorway entrance or exit. Tap this button to report an error about a postcode. Tap this button to report other types of corrections. These corrections are not immediately applied to your map but are saved in a special report. You can report missing streets, errors in motorway entrances and exits and missing roundabouts. If the correction you want to report is not covered by any of these report types, enter a general description then tap Other. Important: For safety reasons, do not enter the full details of a map change while you are driving. You can always mark the location and create the report later. Press and hold to select the location of the map change on the map view. Select Report Map Error from the pop-up menu. Select the type of map change you want to apply. Follow the instructions for your chosen type of map change. Your map change report is sent to TomTom in real time or when you connect your device to MyDrive Connect using a USB connection. 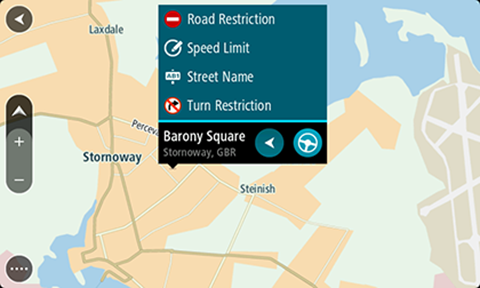 You receive map changes from other TomTom users as part of map updates. Tip: If you have a smartphone-connected device, reports are sent when your device is connected to TomTom services or when you connect your device to MyDrive Connect using a USB connection. Use the online MapShare Reporter to report a change. For more information about using the MapShare Reporter, see our FAQ: What is the MapShare Reporter and how do I use it?